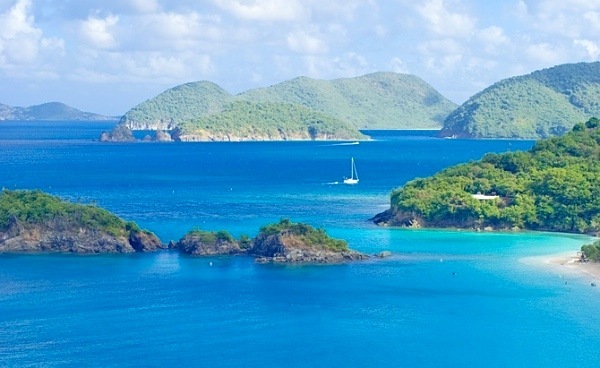 Walk in the footsteps of pirates, dive among lost shipwrecks, and sail off to your own deserted sanctuary in the British Virgin Islands, peaceful refuge of lush landscapes, nature, and vivid history. A distinctly nautical flavor suffuses the British Virgin Islands (BVI), which lay just 50 miles from the shores of Puerto Rico. Not surprising, as the territory’s 60 islands, islets, and cays are lined with powder white beaches and tranquil turquoise waters, surrounded by extensive roster of shipwrecks, and dotted with protected anchorages and harbors filled with yachts, charter boats, and windsurfers. Ahoy, adventurers, romantics, and escapists! The largest island in the chain, Tortola, is where you’ll find accommodations from quiet hideaway villas to luxury resorts with every imaginable amenity, none of them taller than the palm trees that line their secluded beaches. Road Town, the capital city, is the place for shopping; local spices, jams, rums, soaps, handcrafted jewelry, silk-screened fabrics, and local art provide the best bargains. Cuisine reflects the island’s rich cultural mix, and centers on sich delicacies as fresh lobster, conch, spicy goat, curries, and Johnny Cakes. Only ten miles long and two miles wide, Virgin Gorda is ideal for vacationers who long to spend day after day lounging amid quiet stretches of sand, rocky-ridged mountains, and The Baths, where huge granite boulders create mysterious grottoes and saltwater pools that are perfect for a day of exploring, swimming, and snorkeling. Gorda Peak National Park entices hikers with a set of trails that lead to an observation point on wooded Gorda Peak, the highest point on the island. And for wildlife lovers, Little Fort National Park is a 30-acre sanctuary containing the remains of a Spanish fort. Stake a claim to your own blissful sanctuary in the British Virgin Islands. This entry was posted in All-Inclusive, British Virgin Islands, Caribbean, Hotels and Resorts, Weddings/Honeymoons and tagged Biras Creek Resort, Bitter End Yacht Club, British Virgin Islands, Caribbean, Long Bay Beach and Villas, Rosewood Little Dix Bay.